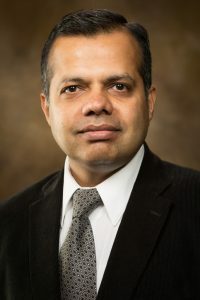 Dinesh Gauri, a professor in the Department of Marketing and head of the University of Arkansas Retailing Research Initiative, today announced the results of his survey that found distinct consumer perceptions of Walmart, Amazon and Target. Gauri initiated the online survey of 547 individuals in December 2017. The respondents to questions about consumer behavior towards general merchandise and grocery retailers revealed distinct divisions among the three large retailers. The study was in response to the dynamic and chaotic nature of today’s retailing, Gauri said. He said U.S. retail accounts for 16 percent of U.S. GDP with just a few key retailers contributing most heavily. Mergers and acquisition continue to change the retail landscape, and with Amazon growth and ecommerce on the rise, it was time to check shopper perceptions toward the three major retailers: Walmart, Amazon and Target, Gauri said. In order to recruit participants and execute the study, Gauri engaged Vincent McCabe, Inc., a research administrator in New York. Vincent McCabe developed the online survey and recruited a representative sample of respondents from U.S. consumers. Of the 547 respondents, 65 percent are female and 35 percent are male. Most of respondents indicated that they had shopping experience with all three of the major retailers. To help score each retailer, respondents were asked to identify and evaluate features they considered important. The top scoring features for those surveyed were safety and security of data, competitive prices, honesty and trustworthiness, a wide range of choices and offering desired brands. The complete report, which is available from Gauri, details the three retailers’ scores on the features of importance for both general merchandise and groceries. For more information about the University of Arkansas Retailing Research Initiative and detailed results of the study, contact Dinesh K. Gauri at dgauri@walton.urk.edu or 479-575-3903.